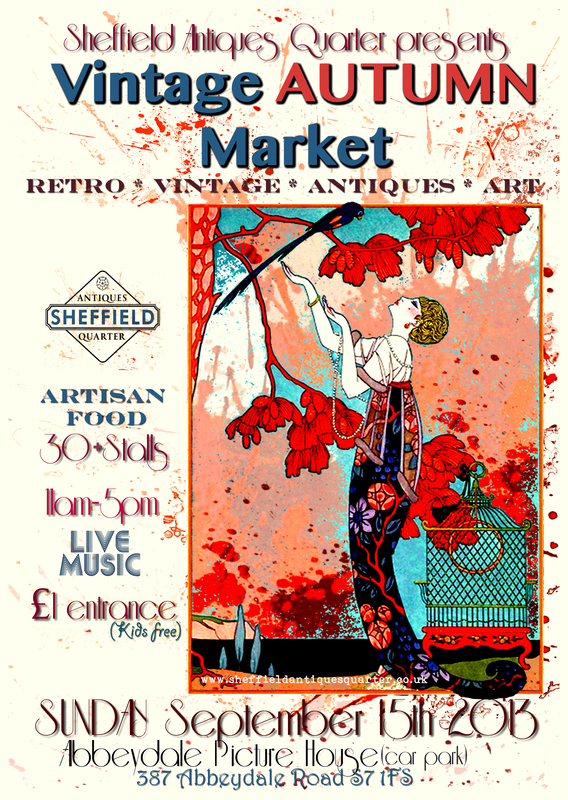 Vintage Autumn Market – Sept 15th 11am-5pm @ Abbeydale Picture House (car park) | IT'S HAPPENING IN HEELEY! The Market will relocate from its previous base on Broadfield Road, to the Abbeydale Picture House (car park) on Abbeydale Road. This represents yet further forging of links between businesses within the new Quarter as the new owner of the Picture House, Phil Robins, is offering the group use of his car park free of charge. Phil will also be opening the doors of the old Picture House to offer tours throughout the day and to explain the plans for its future. The Vintage Market will include 30+ retro, vintage, arts and antique stalls plus food stalls and vintage teas. There will be live music organised by The Rude Shipyard and a bar serving local beer from The Broadfield. The market is also an opportunity for the Sheffield Antiques Quarter group, which now has 35 members, to inform people about the plans for ‘Signing the Quarter’ with local sign-posting and promotional art projects, aswell as city-wide brown (heritage) signs. The group is preparing a crowdfunding application to develop the plans which will help to define the area more clearly and they hope people will be able to contribute opinions and show their support at the event on Sunday.